What’s CyberLink Application Manager (CAM)? CyberLink Application Manager (CAM) helps you manage your CyberLink subscription software and download digital copies of your retail box software. Once you sign in with your CyberLink Members Zone account, the CyberLink Application Manager informs you if there are any updates or upgrades to your software available, provides direct access to these latest versions of your software, and helps you manage your subscriptions. Once signed in, all your available CyberLink subscription software is shown in the panel. Just one click of Download & Install to the right of the product is all you need to do to complete the entire download and installation process. 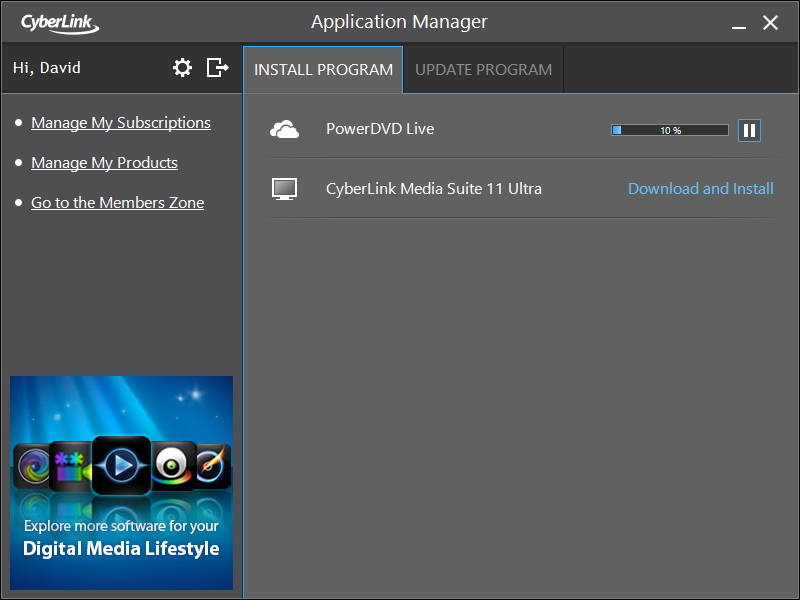 CyberLink Application Manager will download and install the latest version of your software for you. You also can conveniently download the retail box versions of CyberLink software in the CyberLink Application Manager after your product key is verified by the CyberLink Digital Locker. You can download it an unlimited about of times for 30 days. Note: The retail box software includes a sticker that will guide you through the process of redeeming your digital copy. If you still need help you can contact CyberLink Customer Support.